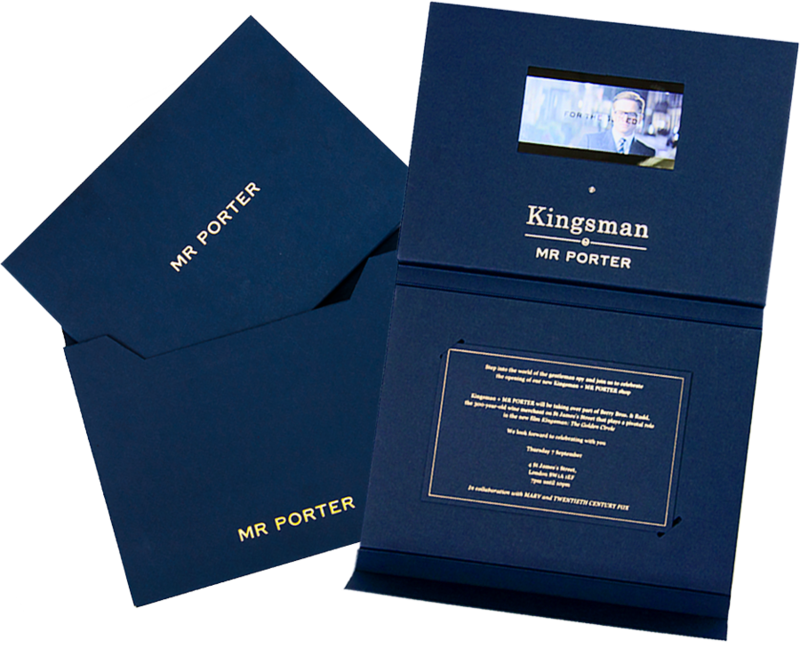 To celebrate the opening of the Kingsman M​R PORTER​ store in St James’ ​London ​alongside the launch of ​the years blockbuster movie T​he Golden Circle – we were approached​ by the team at M​R PORTER​ to provide a handcrafted interactive invite for the combined launch event. M​R PORTER ​have worked closely with our product design team over the past few years to showcase their new ranges to Worldwide press using innovative, beautifully packaged video brochures​, combining bespoke, cardboard engineered covers to house HD ​LCD ​video screens – complementing M​R PORTER’s​ ​design aesthetic, ​eye for ​detail​,​ craftsmanship and quality. The Kingsman ‘The Golden Circle’ luxury invite was produced in partnership with our print partner (the UK’s premier print packaging company) using ​handcrafted GS Smith card stock, bespoke CAD cutting, spot foiling and complex hand finishing, resulting in a stylish, tailored memorable piece, housed in a matching mailer – it oozed pure class. The video content matched the packaging with ​the perfectly edited film trailer overflowing in action, ​style & humour – in classic Kingsman fashion. The interactive invites were mailed to Fashion Editors, Stylists and VIP’s for the event in St James​’s to view the 60-piece collection​ ​MR PORTER had worked in concert with director Mr Matthew Vaughn, costume designer Ms Arianne Phillips that includes suits, watches, ties, umbrellas, briefcases and more. Featuring both US and UK designer brands, attendees included Mark Strong, Sam Rollison, Toby Bateman, Claudia Schiffer & director Matthew Vaughn. Once again our partnership with MR PORTER delivered a unique & memorable piece effortlessly combining, fashion, technology and bespoke print.